The King of Cambodia (Khmer: ព្រះមហាក្សត្រនៃព្រះរាជាណាចក្រកម្ពុជា, French: Roi du Royaume du Cambodge) is the head of state of the Kingdom of Cambodia. The King's power is limited to that of a symbolic figurehead to whom people are to give love and respect. The monarch also represents peace, stability, and prosperity to the Khmer people. Since 1993, the King of Cambodia is an elected monarch, making Cambodia one of the few elective monarchies of the world. The king is elected for life from among the members of the Norodom and Sisowath bloodline who are at least 30 years old by the Royal Council of the Throne, which consists of several senior political and religious figures. Appointing the Prime Minister of Cambodia and the Cabinet of Cambodia. Convening over the opening of the two legislative bodies, the National Assembly of Cambodia and the Senate of Cambodia. Serving as the Supreme Commander of the Royal Cambodian Armed Forces. Meeting with the Prime Minister on a monthly basis in which the King is briefed on matters of state. Signing the royal code/ decree that gives effect to laws enacted by the legislature and proposals by the cabinet. Acting as "supreme arbiter" to enable the functioning of state institutions. Possessing the power of commutation and pardon. Presiding over the Supreme Council of the Magistracy. The king also fulfils other roles not explicitly mentioned in the constitution in his capacity as head of state like for example, presiding over events of national significance, including religious ceremonies and traditions integral to the Khmer nation, supporting humanitarian and philanthropic causes and representing Cambodia abroad when undertaking official visits overseas. The Ministry of the Royal Palace, currently overseen by minister Kong Sam Ol in conjunction with the Supreme Privy Advisory Council, headed by the king's half-brother Prince Norodom Ranariddh assists and advises the king accordingly in carrying out his duties as monarch. The first major Thai kingdom was created in 1238 during the reign of Indravarman by Pho Khun Si Intharathit in Sukhothai, an area formerly ruled by Lavo in vassalage to Angkor. Siam Invasion: 1393 (5 months). Outey was the younger brother of Chey Chettha II. On his brother's death he was offered the crown but declined, and took instead the title of Upayoreach, not exactly translatable into English. Ponhea To, a son of Chey Chettha II, became king. Ponhea To rebelled against his uncle the Upayoreach and was killed. His younger brother Ponhea Nu succeeded him as king, Outey continuing as Upayoreach. Son of Chey Chettha II, passed over when Ponhea Chan was made king. Murdered his nephew and uncle to become king. ^ "CAMBODIA—The Varman Dynasty Genealogy". royalark.net. Retrieved 17 November 2016. ^ Queen Sisowath Kossamak was not an official monarch, but a "symbol, incarnation, and representative" of the dynasty after the death of her husband, King Norodom Suramarit. 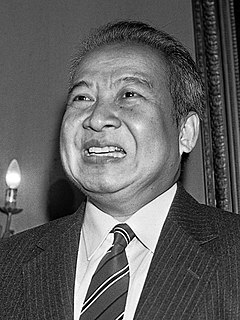 Prince Norodom Sihanouk was appointed Head of State whose powers equal that of a monarch. The politics of Cambodia are defined within the framework of a constitutional monarchy, in which the King serves as the head of state, and the prime minister is the head of government. The collapse of communism set in motion events that led to the withdrawal of the Vietnamese armed forces, which had established their presence in the country since the fall of the Khmer Rouge. The 1993 constitution, which is currently in force, was promulgated as a result of the 1991 Paris Peace Agreements, followed by elections organized under the aegis of the United Nations Transitional Authority in Cambodia. The constitution proclaims a liberal, multiparty democracy in which powers are devolved to the executive, the judiciary and the legislature. Furthermore, the governing charter declares Cambodia to be an "independent, sovereign, peaceful, permanently neutral and non-aligned State." Norodom Suramarit was King of Cambodia from 1955 until his death in 1960. He was the father of King Norodom Sihanouk and the grandfather of Cambodia's current king, Norodom Sihamoni. Suramarit was born in Phnom Penh. He was the son of Prince Norodom Sutharot and grandson of King Norodom. Norodom Sihamoni is the King of Cambodia. He became King on 14 October 2004, a week after the abdication of King Norodom Sihanouk. He is the eldest son of King Sihanouk and Queen Norodom Monineath. He was Cambodia's ambassador to UNESCO and named by a nine-member throne council to become the next king after his father Norodom Sihanouk abdicated in 2004. Before ascending the throne, Sihamoni was educated in the Czech Republic and was best known for his work as a cultural ambassador in Europe and as a classical dance instructor. Sisowath was king of Cambodia from 1904 to his death in 1927. 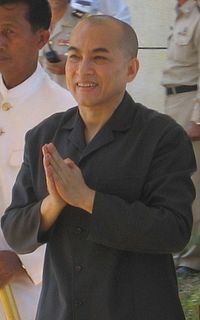 He was the son of King Ang Duong and half brother of Prince Si Votha and King Norodom. The Prime Minister of the Kingdom of Cambodia is the head of government of Cambodia. The prime minister is also the chairman of the Cabinet and leads the executive branch of the Royal Cambodian Government. The prime minister is required to be a member of parliament, and is appointed by the monarch for a term of five years. Since 1945, 36 individuals have served as prime minister. The National Assembly is one of the two houses (chambers) of the Parliament of Cambodia. It is referred to as the lower house, with the Senate being referred to as the upper house. Prince Norodom Yuvaneath is the first son of the late king of Cambodia, Norodom Sihanouk and Princess Sisowath Pongsanmoni. He is the half-brother of the current king, Norodom Sihamoni. Norodom Monineath Sihanouk is the queen mother of Cambodia. She was queen consort of Cambodia from 1952 to 1955 and again from 1993 to 2004, as the wife of King Norodom Sihanouk. She is the widow of King-Father Norodom Sihanouk, whom she married in 1952. Queen Monineath and King Sihanouk parented two children: Norodom Sihamoni and Norodom Narindrapong (1954-2003). Her official, full title is " Samdech Preah Mahaksatrey Norodom Monineath Sihanouk". The Queen is also called "Preah Voreakreach Meada Cheat Khmer". Her birthday on 18 June is an official public holiday in Cambodia. This is a list of heads of state of Cambodia from the accession of King Norodom on 19 October 1860 to the present day. It lists various heads of state which served in the modern history of Cambodia, under several different regimes and with several different titles. Preah Mahaksatriyani Sisowath Monivong Kossamak Nearirath Serey Vathana was the Queen consort of Cambodia from 1955 to 1960 by marriage to King Norodom Suramarit. Sisowath Kossamak was born Princess of Cambodia as the daughter of King Sisowath Monivong of Cambodia. After her husband's death, she became the symbol and representative of the monarchy while her only son, Norodom Sihanouk, assumed a role equal to that of a monarch. The Cabinet of Cambodia, officially known as the Council of Ministers, is the executive body of the Kingdom of Cambodia led by the Prime Minister, assisted by Deputy Prime Ministers, Senior Ministers, Ministers, and Secretaries of State. Members of the Cabinet are nominated by the Prime Minister and appointed by the Monarch. The House of Norodom is the ruling royal house of Cambodia. It was founded in 1860 by King Norodom I, a son of the "Great-King", Ang Duong. The current head of the House of Norodom is the current king of Cambodia, Norodom Sihamoni. Norodom is one of only two royal houses of Cambodia. Its counterpart, the House of Sisowath, is named for another son of Ang Duong, Sisowath I. The House of Norodom has produced four monarchs of Cambodia, and three Prime Ministers. On 15 October 2012, former Cambodian King and Prime Minister Norodom Sihanouk died at the age of 89, in Beijing, China, after suffering health issues. His death was announced by Deputy Prime Minister Nhek Bun Chhay. His body was brought back on 17 October 2012 by King Norodom Sihamoni and Prime Minister Hun Sen. State flags flew at half mast, and the government announced a 7-day mourning period for the former king. 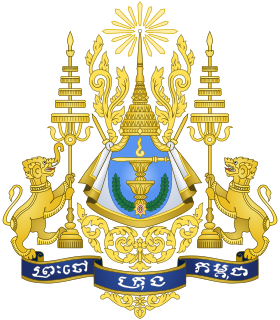 The Royal Council of the Throne of Cambodia is a nine-member council of Cambodia responsible for selecting the Cambodian monarch. It was established by the constitution on 24 September 1993. The nine members of the council include the Prime Minister, President of the National Assembly, President of the Senate, First and Second Vice Presidents of the National Assembly, First and Second Vice Presidents of the Senate, and the two heads of the order of Mahanikay and Thammayut. The council was active only in October 2004 when it named Norodom Sihamoni as the new king. The voting is conducted through a secret ballot by the nine members.